Formerly List of all badges with full descriptions. What are badge name's requirements? Why didn't I get badge name (right now)? Which badges can I earn multiple times? Note: Some badges are awarded based on score. The term score means the total number of upvotes minus the total number of downvotes. Any badge with a *** next to it is one of 20 badges that count towards the candidate score displayed on a moderator candidate in an election. The candidate score is a total of 40 points: the first 20 are awarded based on the user's rep divided by 1000 and rounded down; the second 20 represents the total number of unique badges earned of the 20 that count. Note that if the same badge is earned multiple times, it will only count once towards the candidate score. Visit the Badges section of the Help Center on any site to see a complete list of badges that you can filter by earned, unearned, or type. Manually awarding means manually selecting a bounty winner; letting the system auto-award half the bounty does not count (source). Not awarded on per-site metas, since those sites do not have bounties. Manually awarding means manually selecting a bounty winner; letting the system auto-award half the bounty does not count (source); letting the system auto-award the full bounty to an accepted answer does not count either. Positive: Number of questions asked on this day that have a score greater than 0. Negative: Number of questions asked on this day that have a score less than 0. Closed: Number of questions asked on this day that are currently closed and the current closure date occurred within 60 days of being asked. Deleted: Number of questions asked on this day that are currently deleted and the current deletion date occurred within 60 days of being asked. Any day that has at least 1 Positive question and also has no Negative, Closed, or Deleted questions counts as a GoodDay which increments the counter. A positive question record means you don't have too many closed, downvoted or deleted questions, overall. The formula is (TotalQuestions - Negative - Closed - Deleted) / TotalQuestions ≥ 0.5. Questions that qualify as Negative and Closed and Deleted count three times in this calculation! Ask a question that after its first 7 days of existence has a score of 0, no answers, no comments, and no more than 60 views. Note that the badge is still awarded if the question has as many upvotes as it does downvotes; it doesn't necessarily need to have no votes at all. The purpose explained in What is the purpose of the tumbleweed badge? Be the first person to answer a question, and receive a score of at least ten for that answer. The answer must be accepted by the question owner, and it mustn't be a self-accept. Edit 50 questions each within 12 hours of answering it (score>0). Edit 500 questions each within 12 hours of answering it (score>0). Answers must have a score of 1 or greater. Only body and title edits on the question count, tag-only edits do not. The question must remain open. Provide an answer to a question that is at least 30 days old at the time of answering. Your answer reaches a score of two. No other answers posted earlier than your answer currently have a score of two. "Earlier" refers to the time the answer was originally posted (first revision). Users may earn badges on any site for positive contributions to established tags used on that site. Each tag badge has the same name as the tag for which it was awarded. When a user meets the requirements for a tag badge that has never been awarded, the system creates and awards it automatically. These badges are displayed with a white background, unlike other badges that are displayed with a black background. What is a tag score? A tag score is basically the combined total of all the upvotes (+1) and downvotes (-1) you've accumulated on answers under that specific tag (votes on questions do not count). As well, posts which are in community wiki status or that have been deleted do not count towards your tag score. Tag scores are only recalculated once daily, at 03:00 UTC. Unlike most other badges, tag badges are revoked immediately if you ever cease to meet their criteria, which can happen if your answers are downvoted, deleted, or converted to community wiki, if the tag is removed from questions that you've answered, or if the tag becomes ineligible for badges because it's no longer used on 100+ questions. NOTE: even though many badges have same name as Q&A site badges, the requirements are often different, e.g. Great Question which requires score of 50 and not 100. See the list here. This can be tracked in the user profile under "consecutive days"
Simply loading the site is not enough to count as a "visit"
Participate in every phase of a successful site. There are four required steps to earn this badge for a site. During Definition, provide at least one example question that receives a positive score. During Commitment, commit to the proposal. During Beta, follow through on the commitment you promised. Not awarded to ♦ moderators, only to regular registered users (source). Complete at least one review task. The review doesn't necessarily have to take place via /review. That means users with low reputation are able to gain this badge, when reviewing a suggested edit on one of their own posts. Proposed at two levels: silver at 1000 reviews/300 actions and bronze at 300/60. Initially introduced as a bronze badge with the 300/60 requirement, but was changed to silver at 1000/200 approximately one day later. Posts that you own but are not self deleted do not count. This seems to be an especially confusing badge, so here are some examples to address cases commonly complained about on MSO. Total is just the total number of votes cast (Questions + Answers) and Ratio is the total number of votes cast that are on questions. If you answer a question and earn a score of at least one, all other answers to that question are considered "competing answers"
If you upvote multiple competing answers on a single question, this counts multiple times, irrespective of how many (upvoted) answers you have on that question. Originally proposed in June 2009; implemented October 2010. Cast 40 votes - the maximum (limit) for a single day. It is possible for the system to restrict you to fewer than 40 votes in a day. You get two types of votes per day: ten can be used only on questions ("Q-votes") and 30 can be used on either questions or answers ("QA-votes"). When you vote on a question, the system tries to use your Q-votes before your QA-votes. When you only have five QA-votes left for the day, you can no longer use your Q-votes. The "You have n votes left today" counter starts to appear after you cast votes. This means that if you start a day by voting mostly on answers and burning through your QA-votes first, it'll be impossible for you to reach 40 votes that day. First suggested here by waffles. A proposed refinement by Bill the Lizard was implemented a few days later. All of the following events count towards a specific day's total reputation calculation: upvotes and unupvotes, accepts (both to the asker and the answerer) and unaccepts, suggested edit approvals, bounties earned, and documentation reputation events (on Stack Overflow). Any other events like downvotes, the association bonus, vote invalidations, and deletions are not considered. Votes that are later deleted for any reason (manually retracted or invalidated) do not affect previous days' reputation earned calculation. Unupvotes and unacceptes affect the day the undo event occurred. Each "day" lasts from midnight UTC to immediately before midnight, UTC; days are not counted in local time. Awarded to those who followed the Area 51 proposal for a particular Stack Exchange site before it entered the commitment phase, when the site enters its private beta phase. Despite this, it still appears in the badge list for every site in order to inform and incentivize participation on Area 51. Each message is only counted once, and each user is only counted once. So it’s not enough if one message is starred by nine people, and a tenth user stars nine other messages. If you want to know, here’s the precise definition: Consider the bipartite graph whose vertices are all your messages and all the users, and whose edges are the stars you received. So a user (vertex) and a message (vertex) are connected by an edge if and only if the given user has starred the given message. You are eligible for the Outspoken badge if and only if this graph has a matching number of at least ten. The number of years is not restricted to integers and increases continuously. For example, if at the 2-year mark you don’t have the 400 required reputation, the number of years still continues to increase. So half way through year 3 (i.e., after 2.5 years), you’d need 2.5 × 200 = 500 reputation to qualify for the second yearling badge. You can be awarded only one badge each time the script runs; if you find yourself suddenly qualifying for multiple badges, expect to get one each time the script runs until you're caught up. As of June 2013, this badge is no longer awarded due to the FAQ being changed to the Help Center all across the network. Those who earned it previously get to keep it. In order to get credit for a certain click, the link must be a short-form link that contains your user ID (e.g. https://$site/[q|a]/[post ID]/[user ID]). Short links that don't contain the "user ID" portion and full-form links don't count. If you want to be sure a particular link counts, use the "share" button underneath the post. Prior to early 2017, only links from outside the Stack Exchange network counted. This was changed for technical reasons as a result of the changeover to HTTPS, and was awarded retroactively. Introduced in Stack Overflow blog post Announcer, Booster, and Publicist Badges (although the unique IP addresses requirement changed and time limit requirement was dropped). For the 2017 and 2018 iterations of the Developer Survey, the badge could only be earned on Stack Overflow. For the 2019 Developer Survey, users have the option to earn the badge on a selection of technical sites other than Stack Overflow. After completing the survey, the user will be prompted to choose which one site to award the badge on. The first badge that is awarded immediately and not by a scheduled job. 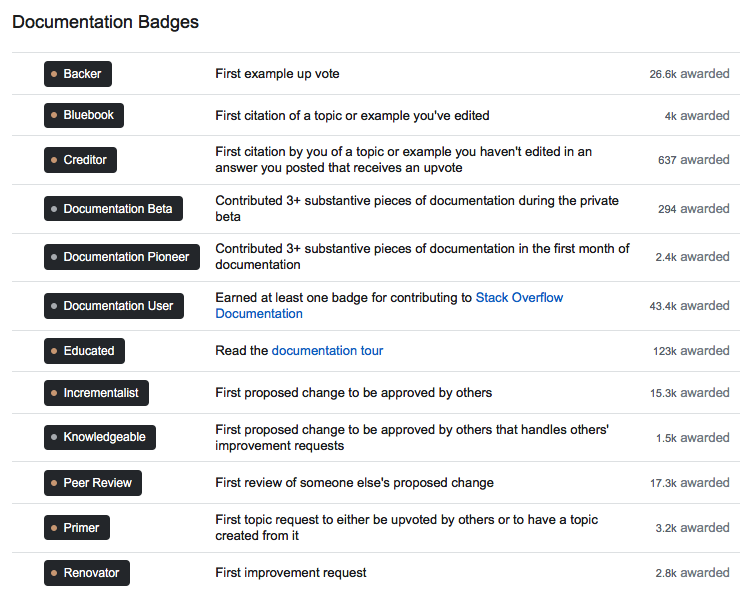 As Stack Overflow Documentation has been discontinued, all Documentation badges, except for Documentation Beta and Documentation Pioneer, have been retired and revoked from users who earned them. In exchange, a new single silver badge, Documentation User, was awarded to those who earned at least one Documentation badge, excluding Educated. We also have a longstanding policy against revoking badges. But we've never had a badge set for a discontinued beta feature either. While we could just retire them, it seems confusing to show expired Documentation features on the list of badges. In addition, we'd lose a lot of good names for potential future badges. As a compromise, anyone who earned a Documentation badge other than Educated (for reading the tour) will be issued a newly minted silver Documentation Beta badge. Here's a screenshot of the Docs badge set before most badges were retired. The following badges remain after Documentation was phased out. Note that only one badge is awarded to each user, no matter how many retired badges they earned. As all Documentation badges (except the above two) have been revoked, this badge is meant as a compromise for those who earned at least one Documentation badge during the beta. The following badges were revoked after Documentation was retired. This badge does not count towards earning the Documentation User badge. Why didn't I get badge name right now? Most badges (with the exception of the Informed badge) are awarded by a scheduled job which runs once every hour and are non-deterministic, i.e. there is no guarantee that your badge will be awarded within an hour. Additionally, if an event occurs during the time between you qualifying for the badge and the scheduled job running that causes you to no longer qualify for the badge, you will not earn the badge. For instance, if you edit and answer a question and your answer gets upvoted, but it gets downvoted back to 0 before the script runs, you won't earn the Explainer badge. If the badge is one that can be tracked in the user profile, it may take some time before it once again shows up as a trackable badge. Tag badges are based on tag scores, and those are calculated once every day (in the early UTC morning), so tag badges are awarded even less often. More information can be found here: How long does it take for badges to be awarded? How are they generated? Not the answer you're looking for? Browse other questions tagged support faq badges tag-badges . How can I get the “Electorate” badge? Why do I not have the unsung hero badge? How do I earn the publicist badge? How do you earn the Enthusiast badge? What's the secret condition for getting the populist badge? Can we have a badge for earning at least 200 reputation each day for 10 days? How can I find the *exact* reason for being awarded a badge? Can we retire the Reversal badge on main sites and keep it only for meta sites?